Each mitt is knit as a square from one corner to the opposite corner, with reverse stockinette stitch surrounding an embossed leaf in the lower half of the unit, a row of eyelets through the middle, and alternating stockinettestitch and reverse stockinette stitch ribbing above. The garter stitch rows feature a yarn over increase at the beginning of each row. 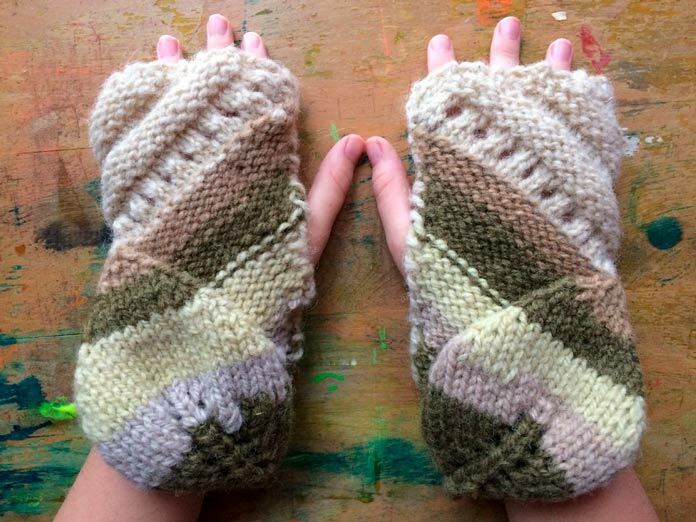 Half of the mitt (the embossed leaf portion) uses yarn dyed with red onions, Burdock, Goldenrod, and Black Walnuts. The other half of the mitt is knit with undyed wool.